The Greatest Santa Photo EVER! Happy Holidays All! I know everyone is all a busy getting ready for the holidays, which is precisely why I haven't posted all week long. I have lots of things going on right now and my anxiety level is pretty high. Like on a terror alert scale I'm in the Orange zone. I like to post cause I get to talk about my day, my workouts, my diet and it eases me and gets my anxiety down but this week I have been busy, like everyone else, going from dawn to dark. and my nerves are just haywire. I woke up 10 minutes before class started and it takes me 25 minutes minimum to get to the gym so I took advantage of the extra sleep and headed to work on time. I'm used to getting ready at the gym and driving to work with no traffic so Wednesday was quite a change of pace. I had to shower at my own house and drive through traffic! haha! 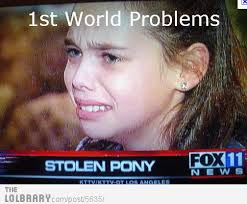 That's a First World Problem if I have ever heard one, poor me right!?!?!? Since I'm trying to fast forward the week a little bit we will get directly to today's workout. First off when I got to class this morning BB Cheryl was there with 2 shoes on...that's right SHE GOT THE BOOT OFF!!! Finally, but she is still restricted so no running yet. Our workout today was a squat series followed by a quick one. When I got to the Power Cleans on round 2 I was ready for it to be over. The first round of burpees really hurt my knee, the same one I tweeked last week and it was finally felling better and Burpee #1 killed. Darn IT! This is part of my anxiety, I have a marathon to run in 4 months and my knee has not been agreeing with me. I also want to do triathlons and I'm not feeling like I can do those right this second because my knee hurts. I also need to be getting more cardio but I haven't been getting it in. Again I like my running, its great cardio and I love it, but I am trying to let the knee feel better so I will be able to do all those things in the sentence before!!! Its just too much for my little mind to process. And on top of everything else I'm finishing up the year, Phase 4 is almost complete and I haven't lost an ounce. I have been way to relaxed in my diet, that's 96% of the problem. I have also relaxed my cardio and gained muscle but the problem is my lack of control of the food going in my mouth. I'm thinking about giving myself a 5th quarter beginning of next year to get closer to my final goal weight, but not if it causes too much stress, I think that causes part of the problem. Wah wah I know! I'm still going to baby my knee for the next little bit until it feels 1oo%. Ill use the rowing machine and the elliptical until things are back to normal. I'm ready for more intensity and now that I'm getting the hang of Crossfit I think I know how to get my workout and some additional afterwards. I know I can get it all together again, I always do, but I needed to talk about it a little bit! Thanks for letting me vent a little tonight, I already feel some better. Good news alert: My gym is putting in a Juice Bar. Finally, fresh juice in the morning that I can buy instead of trying to do the night before. I think I can work that into my budget so I don't have to tote a blender around. Now to bed so I don't end up missing two classes this week due to oversleeping! I managed to get there everyday last week sick and slept in, psh! Night All! And one more thing....don't forget to follow Fancy. She has been up to no good already! I have updated her post with all the things she has been up to so far, but everyday she keeps getting worse and worse.